Thread: freelancer.com took back my money due to employer account problems. Hi, i hope i posted in the right section. I have won a project a few weeks ago, the employer was okay, payed the milestones when he should, he had good reviews and so on, i delivered the files, the project was closed, the final payment was received, reviews exchanged and everything was okay. Today i log in to freelancer and i discover that the project is opened again, and the entire sum i have been payed for MY WORK has been taken back by freelancer due to some.... account problems on the employers side. Can they do that?? after all i lost time to deliver the work, i have lost fee for winning the project, now i lost the money for the entire project, lost good review and rating (now i have delayed time on completing the project... cuz it was finished 2 weeks ago, and it's still active). What can i do?? why did they take the money from my account if employer has problems?? Shouldn't have they verified him better?? it's not my freaking fault, why should i pay.... they screwed it up they pay. Re: freelancer.com took back my money due to employer account problems. Freelancer.com is the world's largest outsourcing marketplace. Just post any online project you want done, in 3 easy steps, and one of our 4.2 million Freelancers will do it at a fraction of the cost! There are lots of great reasons to use our marketplace. Freelancer.com. makes your business more competitive and accelerates your profit and growth. You get quality work at an affordable price and only pay for work you're 100% happy with. It's quick and easy to post a project and our expert support team is ready to help if you have any questions. Your first project is FREE so why not give it a try today! It appears the project creator is only obligated to pay if they are "satisfied." That is a terrible situation for the freelancer to enter into as they have no recourse under any contract. What kind of account was your pay in? How were they able to take back what you were paid? the employer didn't take back the money, FREELANCER.com did, reason: "employer account problems". The employer payed the project in full, 2-3weeks ago when it ended. He gave 5start overall rating also. it's not my fault freelancer can't freaking check accounts, and i don't care what problems they have with their accounts. I have completed a job, i have been payed for it i want to keep my money. Their internal / external problem with payments or accounts.... they solve it, they take the blame, they suffer the consequences. I understand your anger over this, but I don't think you will have much success in getting the outcome you want due to the terms and conditions of the website as it leaves anyone who completes any work for someone open to abuse! I don't know how it works as I haven't used the site, you say you had been paid but they have taken it back? Where you paid by paypal or some other transaction? Or do they pay it into your account on their website? I assume its the latter. It would appear that whoever you did the work for has not paid freelancer.com so they have cancelled or withdrawn the original payment from your account, I would try and find out who this was and bill them for your work directly and if you don't get paid take them to a small claims court in the uk or similar to this in your country. I do hope you manage to resolve this to your satisfaction. • any claim, damage, or loss which may be incurred by you as a result of any of your transactions involving the Site. • The limitations on Freelancer.com's liability to you above shall apply whether or not Freelancer.com, its affiliates or staff have been advised of the possibility of such losses or damages arising. Notwithstanding the above provisions, nothing in this Agreement is intended to limit or exclude any liability on the part of Freelancer.com and its affiliates and related entities where and to the extent that applicable law prohibits such exclusion or limitation including those within the Trade Practices Act 1974 (Cth) and relevant state fair trading legislation. Freelancer.com may plead this User Agreement in bar to any claim, action, proceeding or suit brought by you, against Freelancer.com for any matter arising out of any transaction or otherwise in respect of this User Agreement. Freelancer.com is claiming they have no liability if you don't get paid. They state they have a dispute resolution service here. It is worth a try. Sadly, with these deals it can be an uphill battle. You took a great first step by exposing them here. Making reports to all the enforcement agencies in Australia would be the next step. If the dollar amount is high enough to warrant it, then small claims or a lawyer would be something to consider. so, freelancer works like this. you create account, you link it to ur paypal or bank account (or cc), you open a project (as a employer), you award the project and eventually you will have to pay milestones for it. You can only pay it if you have money on your paypal / bank acc / cc. So in this situation. the project was awarded, 1- i lost the % from the freelancer Fee, the money were payed by the employer into my freelancer.com account. 2 - he had money in his paypal / bank / cc, the project ended. Now Freelancer (not anyone else, NOT the employer) took the money back because of "employer account problems". ***i have one project that it has been awarded to me, and i have been waiting for 3months for the initial milestone payment. Freelancer.com took their 10% fee INSTANTLY when i won the project (about 75$), since then, they have done nothing to force the employer to send me the initial milestone payment HE HAS AGREED TO PAY BEFORE I START WORKING. so atm, i have 1 unfinished and pass due project and -75$ in my overall balance. I understand that they don't take responsability for such things, but can i appeal to someone to make them change this system? because frankly they can make accounts, create fake projects, award them, never pay any kind of money to the employee and just cash in the fees. I see a lot of complaints about this deal online. The more attention online, the more likely law enforcement will act. Complaining to PayPal might be a good avenue to explore as well. You might also check another thread here in RealScam concerning the same type of nonpayment by Freelance. We can probably expect a visit from one of the many Freelancer bots which seem to pop up on every forum where a complaint against the company is posted. Watch for the same cookie cutter type response as appears on a squillion other forums. Well now is the time to come together and make those changes so many of you are requesting!! Sign this petition and get something done!! The website which boasts of more than 7 million freelancers has been conning its users out of their hard earned money for many years now. There is no response from the company's side and those who dare to speak out are slapped with Cease & Desist Orders from the lawyers of this scam site. In some cases the money earned on the site has been the sole livelihood of the members who have been left in the lurch by this arrogant, ignorant, uncaring, and at times a hand in glove conspirator with scammers firm. I request you to to wake up and deliver justice to the victims of this so called 'World's Largest Marketplace for Outsourcing'. I have been in this for 2 years, and have accepted 3 projects, which I completed it and the project team paid to me via freelancing. But the team which gave project have some dispute with freelancing team and the freelancing team has banned their account. Now they have with held my payment which is already been paid by them and they are forcing me to resolve their issue. Which is unfair and why should I have to resolve their issues?? My work is to get the project and complete it, which I have done and I got the payment long back, but the freelancing team have hold my payment.
" The three Milestone Payments from your employers "gamechanger0523" and "simantika2012" were reversed due to issues on the two members' accounts." What you may want to do in this case is to contact the employers again and amicably resolve the issue with them with regards to the Milestone Payments. 20:00Victor C.: You can also advise them to resolve their account issues with us. Once their account issues are resolved, the Milestone Payments will be reinstated to your account. "Note that the Milestone Payments are on hold due to their account issues with us and they have to resolve this." Below is my transaction history. HENCE ITS COMPLETELY UNFAIR ITS THE ISSUE WITH THE FREELANCING AND THE EMPLOYER AND I AM SUFFERING. So sorry to hear this. Please search freelancer on this site and we have several threads relating to this 'company'. Based on the amount of money you are owed, versus the time and aggravation you want to spend to collect it I have a few suggestions. I would very seriously consider contacting the CEO or the highest up the ladder person at the company you did the work for if at all practical. And I would see if there was some sort of issue that could be addressed to remedy the payment. At the same time I would consider doing the same with the CEO of Freelancer in a businesslike, but firm manner. Consider doing both by certified mail. If that does not work and you still have the energy, you could consider contacting the AG and any other consumer agencies mentioned in the previous thread like BBB. If none of that works then then as mentioned previously you may want to create a little cyber mischief to get your point across. I would keep it factual and professional. For instance I had a friend that was owed money by a company that was refusing to pay. He also happened to have an email distribution list for that company. A little friendly question whether other vendors were having similar payment problems cleared things right up. But at the end of the day, getting beat out of money is an unfortunate part of any business. If you rent apartments people will damage them, a store people will steal, employees will use the internet when they should be working. Not saying it is right, but you certainly need to weight the cost of collecting the debt, against the potential profit of finding a new client. Thanks ribshaw, we have been posting about this company for almost 2 years now and still complaints keep coming in. I am late in posting this from a blog. This should give you a clue Sapna that you are definitely not alone!! I want to unequivocally declare my love for you today. I have known you ever since your site freelancer.com ’mistakenly’ gobbled up my $ 14,000. I am sure it was a mistake because how can some registered firm commit such a big blunder. What if people call you names like hideous, ugly & monster when in all your pics. you look like a handsome werewolf or a blood sucking vampire. I am sure you would have made a more realistic vampire than Robert Pattinson in the Twilight Saga. I am sure all your charms are securely stashed away in a safe place for the parents who abandoned you, for the bullies who gave you swirleys during high school, for the wife who cheated on you and for your children who are inbred B*st*rds. What if a majority of the business community, including both your competitors and allies alike, think that you are a F*cking Moron with an attitude problem…. I am sure that the day they realize that you are capable of taking on multiple personalities like Emir, Valeri Scott, Andrea, Anna (and countless more) and capable of using the scam money to turn your scam legit by taking over competitors like vWorker & Scriptlance, they will realize how intelligent you are. I am sure that the moment they realize you will steadily progress on the path to hell, I am sure that every one will admire you determination. Some one once said, hate the sin and not the sinner. I hereby declare my unequivocal love for you and would like to ask you out. Provide a scanned copy of a currently valid government issued ID, driver’s license or passport which includes your photo, signature, name and date of birth. As a few people from Freelancer.com will be reading the above, a cat grin will appear on their faces. Yeah, you got them: you got the most naive individuals believing you are verry (loved it) strong and that you… (cough) command. This helps while playing dirty tricks, doesn't it? Who will ask some inconvenient questions while believing it is indeed big and strong corporation in front of him? Many people fell into this trap… including me. But when learning this self-proclaimed “World's Largest Outsourcing Marketplace” cannot answer some simple questions (for instance those about: money processing, identity verifications, defaulting on its own rules and so forth…) and being treated in most unprofessional manner (illegal threats, intentional data compromise, slandering me etc.) I have started investigating this whole thing. What have I noticed? All this carelessness, arrogance and incompetence bears worst fruits you can imagine in terms of long term enterprise value. Not going to torture the figures or charts concerning the declared number of users or, say, Facebook fans. Just would like to show the incredible self‑destructive power of Freelancer.com. At the same time I would consider doing the same with the CEO of Freelancer in a businesslike, but firm manner. Consider doing both by certified mail. Ribshaw you have some valid points but for those who have been doing just that, they will probably lol at the statement. CEO Matt Barrie does not have to stoop to dealing directly with clients, that is done mainly through his CS which is about like dealing with robots or worse. Also if you complain you will more than likely receive a letter from their unworthy snarky lawyer who will threaten you to SHUT UP or else. I would love to see legal action taken against this company although I have never been involved directly with them but have read the many valid complaints and how people have completed their work on schedule and in agreement with the TOC with freelancer, only to have their accounts frozen before they can withdraw the funds. In some cases you will read where even if they have received the money through PayPal, all of a sudden the money plus fees have been withdrawn from their PP account. How they continue to get away with this is beyond me and many others. Scratchy I read thorough the other thread last night, and no question it is a scam. No qualification needed. One thing that really jumped out at me was the request for documents AFTER transactions were done. I can't think of a professional instance where 6 months into a gig someone has said we need ID and a criminal background check. I think anyone with a problem would be better served to contact the company they did the work for and ask them to do a charge back and see if they can be paid directly. ClaimS also provided a lot of good information on how to get the word out. Depending on the industry a freelance person was in, I would certainly take time to spread the word. Most professional communities are somewhat closed and it could be helpful to do a little peer to peer muckraking. (Add on, Scratchy I was typing at the same time you were, but I agree after reading the other thread in its complete form contacting scamlancer in any way customer service or other wise would be a complete waste of time.) And due to identity theft and other security concerns I would not send these frauds any form of ID. I warned someone away today with a link to the thread and the work you did. I only changed it to ClaimS to shield you from any legal action. Naah... such operation wouldn't do anything. Anyway... I am not going to pretend anything. I know what I wrote and I know it was the truth. Freelancer.com did the worst thing. Instead of admitting their behavior was unprofessional, they just ignored it and started pretending they feel offended. I have created my blog in the beginning of August 2012, they knew about it since the very beginning. On November the 15th published evidence about them stealing my idea... nudge-nudge: Robert Matthew Barrie (aka Matt Barrie) signed the power of attorney document just a few hours later. Strangely, in the cease & desist note they have missed: violated copyrights of mine, intentional privacy abuses, slandering me in note distributed among my customers, illegal threats and more. I am wondering whether it was those lawyers' idea of using such arrogant tone to begin with. Whoever came up with it, just made the moral damages far bigger (and each day of status quo puts something on top of it). And total damages grow with each and every day of having this situation unregulated. Not mentioning that this discredits Freelancer.com in the eyes of general public. Legal matters? ChaimS probably knows a little about that by now as noted in his blog. Wish Mattie would play fair but I don't think he knows how. Here is one person who is determined to take freelancer to task and I applaud their bravery and would like to see others who have been ripped off to join in this effort. I have been thinking for some time as to whether the stupid and misleading post on freelancer.com’s blog needs to be indeed answered as the facts presented in the post are totally misleading and most of them are not even worth commenting on. Still, just because people like Valerie Scott are trying convince everyone into believing that I am a scammer, I am going to reply to the ‘imaginative conjectures’ that they have tried to use to explain the accusations leveled against them. But to put things into perspective about whether I am a scammer or not. Let us compare the number of links against freelancer as opposed to the ONE link where ‘Matt’ has called me a scammer. Here is a small list of the links where a lot and I mean A LOT of people have complained about the scam that is being run under the garb of this ‘legitimate’ business. 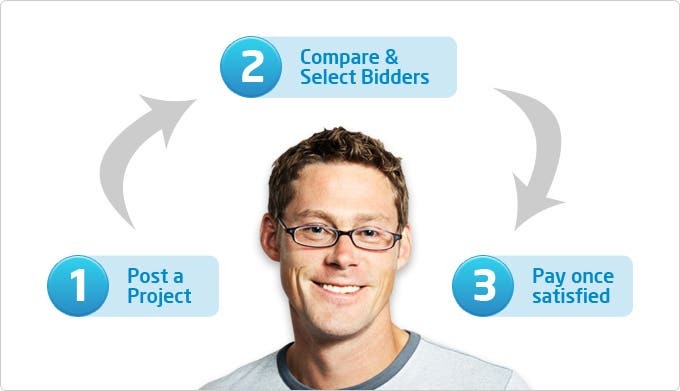 As a relative newcomer to the world of freelancing, bidding sites such as People Per Hour and Freelancer.com are often very useful for me to find and bid on writing and editing projects. So far, I’ve actually found most of my freelance work through these sites. However, I have a major bugbear with Freelancer.com, in particular. Unlike People Per Hour (PPH), which charges both freelancer and buyer a fee to post and bid on projects, it is free for the buyer to post a project on Freelancer.com [edit: I've since found out this isn't true; buyers pay a refundable $5 deposit - see the comments below!]. The successful freelance bidder is charged a minimum of $5 USD for being accepted for a project, and a further $1 for withdrawing funds to PayPal. Of course, because it is so cheap to post a project, there are a great deal more projects listed on Freelancer than on PPH. The quality of projects posted is also considerably lower. Although PPH is more expensive, I much prefer it because the buyers tend to be genuine individuals and companies who wish to outsource their work. At Freelancer.com, there are various problems. Firstly, many buyers openly exploit cheap labour from the developing world. Many will only recruit freelancers from India or the Philippines and as such, it is difficult for experienced, native English-speaking writers to be accepted for projects where the rate of pay is much more than $2 USD per 500 words. Secondly, there is a growing trend for “buyers” on Freelancer.com to ask for free samples of work from bidders. While I do understand that genuine buyers will want to assess the quality of the work that they will ultimately be paying for, a link to previously published work should be enough. What I suspect tends to happen is that the “buyer” will collect these free samples, cancel the project posting and disappear off into the sunset with a few tens or even hundreds of unique articles that he will then try to sell on or pass off as his own work when bidding on another project. My freelancing ID is : luvtodevelopapps and even I am facing the same issue.Freelancing have withheld my amount and the reason is same. But the freelancing had some issues with the employer and they suspended their account and with held my amount.And they are forcing me to resolve their issue.Y the hell I need to resolve their issue?And why they have withheld my amount? Welcome ltdma! Thank you for sharing your story.